1. Slice bananas into 1/8 to 1/4 inch slices. 2. OPTIONAL: Dip banana slices into fruit juice to reduce browning. Sprinkle with cinnamon or other flavorings if desired. 3. Dry until pieces bend like thick leather and no longer feel sticky. Oven Instructions: Set oven to lowest temperature possible (175 to 200 degrees F). Use convection bake if available. 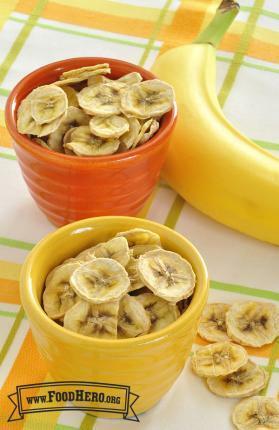 Arrange banana slices in a single layer on a wire rack or baking sheet. A wire rack will help the banana dry faster. A baking sheet takes longer and pieces need to be turned part way through drying. Takes about 1 to 3 hours. Dehydrator Instructions: Arrange banana slices in a single layer on dehydrator racks. Set dehydrator to 135 degrees F; takes 6 to 12 hours. 4. Cool. Store in an airtight container or bag.